Russ Fellows thought gardening was for old people, if it is everyone should be old. Russ decided to chronicle a year in his squarefoot garden that has been growing and developing for the past several years. Corn is one of his favorite things to grow. I love corn, I admit it. When I was a kid I would sneak in to the food storage room with fork and can opener in hand to score a snack. But I have to admit off the cob is my choice. Having said that it was only natural that growing it in the square foot garden would be a no-brainer. Now having grown it for several years there are some things anyone who wants to give it a try should know. First is the planting. Really there is no big secret here, the thing to keep in mind is that there is one seed (one plant) per square. Make certain to plant the seed as close to the center of each square as possible. I didn’t get crazy or anything and get out a ruler, but I think it is pretty easy to eyeball it. 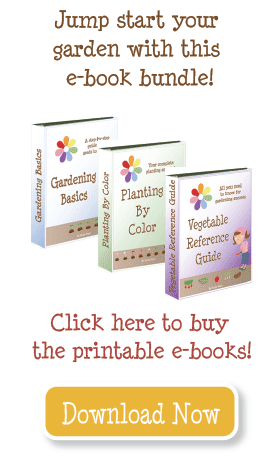 Go ahead and read the package for depth and planting instruction, but really it’s as easy as poking a finger in to the soil an inch to an inch and a half deep and drop a single seed, then cover. If you happen to be reading this in July you really are way too late to plant corn. I think I mentioned earlier how soon to plant, but if not it is around Memorial Day in our neck of the woods. I had read earlier, probably in the official book, that you can/should plant three consecutive squares each a week apart. It could have been the first attempt at corn that I followed that advice. The basic idea is that you can get three weeks of continuos harvest. It sounds good on paper, but I would never do it again and here is why. Once the corn begins to sprout it is difficult to tell which seeds have not germinated since they were planted at up to three weeks apart. For me, I want to make certain every square has a stock. But more important is what happens in the disparity of stock height. In such close quarters, as in a square foot, the stocks are pretty close. What that translates to is one dominate stock literally overshadowing it’s neighbor. Now with limited sun and water some stocks are stunted and never reach complete maturity. So instead of three weeks of continuous harvest, only one makes it followed by two weeks of reduced or no corn. I plant all squares at the same time now and keep a close eye for a few weeks. If a square does not show a germinated seed within two weeks I plant a new seed. If that one doesn’t come up, too bad, I leave a fallow square. Corn stalks can really get tall. I have had some seven plus feet tall in years past. Because of that I think it is really important to have deeper boxes. Back in February I mentioned that our boxes started at six inch depths, but crops like corn really need deeper root systems. One thing to watch carefully in squarefoot corn is wind storms. On several occasions, this year included, I have gone out to the garden to find a significant number of stalks bent to 45 degrees or greater. I imagine the growing medium which is always pretty lose contributes to the leaning, but the deeper the root can go, the stronger the stalk. I did mention deeper boxes right? But what do you do if this happens? Straighten them out. Get the soil a little damp, if it isn’t already, and pack the growing medium around the base of the stock. If this happens when the stocks are only a foot or two tall the probability that they will grow straight afterward is pretty high, but the taller the stock the more difficult. One other thing I have heard some do is to create another grid above the ground with poles up to three feet high to provide support for the stocks as they grow. In theory, or depending how rigid the aerial grid may be, this will prevent the wind blowing over the corn. Right now the day temperatures are well into the 90’s, which the corn loves. It seems the height has increased several inches everyday. But there is a drawback. The tomatoes have been slow anyway because of the cool wet spring, but with temperatures this warm the blossoms abort before fruit can be formed. As you can see several of the stocks have begun to tassel. This is important to note. The reason that corn is traditionally planted in endless rows is because they cross pollinate. The wind blows one stock’s tassel against it’s neighbor’s. That’s why single rows of corn usually don’t produce very well. We usually plant an entire box with corn. I always vote for one of the largest, but every year we rotate the crops around and as of this writing, corn has never been in the same box twice. 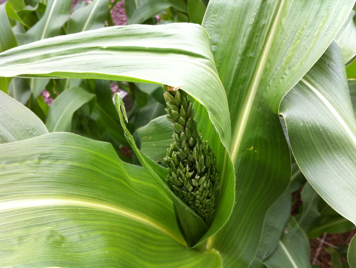 Corn usually does not produce enough in a single box to do much more than simply provide good eating for a few weeks. Perhaps in a year or so we will do multiple boxes in order to freeze some. After the harvest, and once the autumn has kissed the garden with a first freeze I cut down the stocks for my wife to use as porch and yard decorations. I tie a half to a dozen stocks with twine and move them where she wants. What remains is a pretty hardy, dense woody root system in each square. Sometimes I will leave the root in the box until the next spring. Maybe it’s my imagination, but they seem easier to remove at that point. But as for now I watch with anticipation as the stocks creep skyward, dreaming of the butter dribbling down my chin. Hi! I’ve been reading your website for a long time now and finally got the bravery to go ahead and give you a shout out from Houston Texas! Just wanted to say keep up the fantastic job! The official spacing for corn is one per square, but my friend (who has lots of success) plants 2 in one square, 1 in the next. So a 3×6 would have 5, 4, 5, 4, 5, 4 = 27 seeds. With a square foot garden, you really need to support your corn if you live in an area with wind. I had the same issue with the wind blowing my corn. I planted a 3’x3′ box as 3 rows. I did plant about 9 per row, but did not have any luck getting a harvest this year. I’m planning my 2012 garden now and have saved 36 squares (3′ x 12′) for corn. From your article you state 1 seed per square. Did that really work? That seems like a lot of space for one corn. Any suggestions appreciated! Dreaming of butter on my chin too!